Emma Boland (right) and her instructional aid at Warwick Valley High School, Liz Caslander. Birthdays are important to Emma Boland. And not just her own birthday, or the birthdays of her close friends and family. At Warwick Valley High School, Emma is renowned for her ability to remember just about everyone’s date of birth. 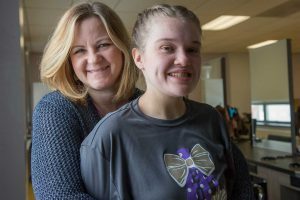 “A birthday is a person’s special day,” explained Emma, who is 17 and a student at Warwick Valley High School. Half birthdays are important, too, she noted. But this year, as her own Dec. 16 birthday approached, Emma decided that she didn’t want presents at her party. Instead, she asked her friends, many of whom are Warwick Valley High School students, to donate to Autism Move-a-thon of Orange County (AMOC). Emma is an active supporter of AMOC and their Special Olympic team “The Thunderbolts,” and she enthusiastically encourages her teammates in basketball, bowling, and track and field, a sport in which also serves as an assistant coach. In all, Emma raised $210 for the Move-a-thon, and she didn’t miss the presents at all. Not one bit. Helping the Move-a-thon was the best gift she could think of, she said. She presented the organization with the check in February. “It made me happy and it made me excited,” to give the money to the Move-a-thon, she said. “It wouldn’t have been possible without the generosity and kindness of Emma’s friends,” added her mom, Kerry Boland. “Everybody in this school is amazing,” she said. Autism Move-a-thon of Orange County (AMOC) works to support families who cope with autism and related disorders, who too often face their struggle in isolation. AMOC raises awareness through outreach activities and events and provides information to empower families. For more call 845-342-2400 or visit www.mhaorangeny.com.